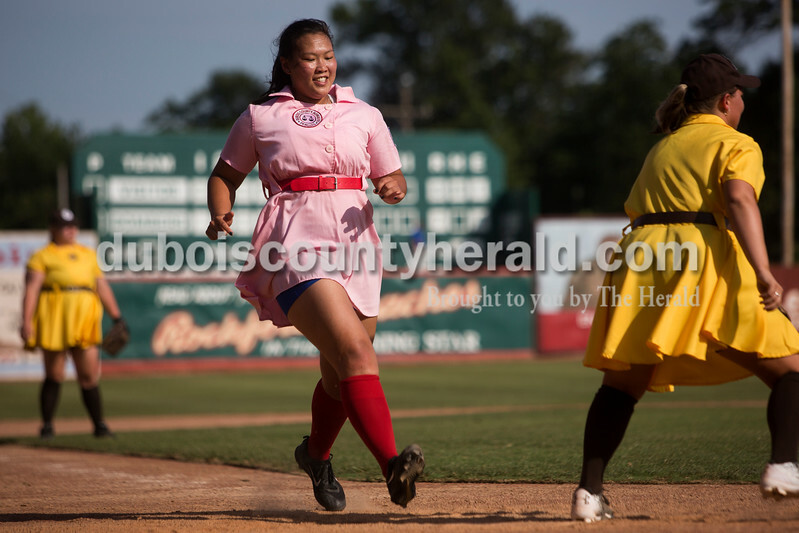 Rockford Peaches' Lauren Sergesketter of Holland ran past her teammates after being announced in the line-up before Saturday's game against the Belles at League Stadium in Huntingburg during the 25th anniversary celebration of "A League of Their Own." The Peaches and Belles tied 8-8 during the 1940s-themed rematch. 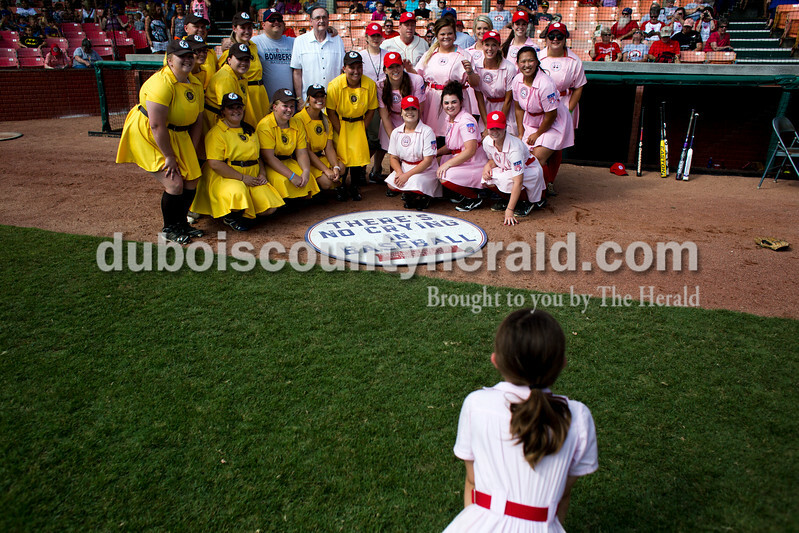 The Rockford Peaches and the Racine Belles gathered together for a picture with some of the original cast of "A League of Their Own" before Saturday's game at League Stadium in Huntingburg. 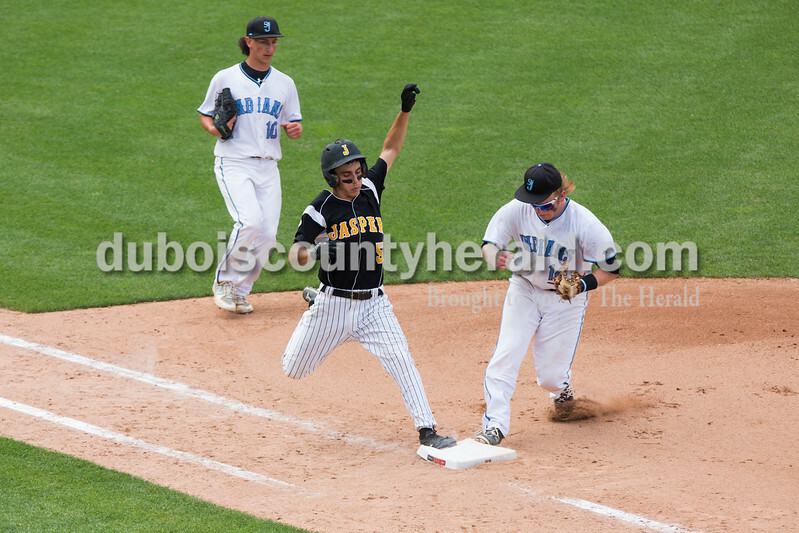 During the 25th anniversary celebration, the Peaches and Belles tied 8-8 in the 1940s-themed rematch. Rockford Peaches' Hayli Scott of Fulda ran to safely to home plate while playing at Saturday's game against the Belles at League Stadium in Huntingburg during the 25th anniversary celebration of "A League of Their Own." The Peaches and Belles tied 8-8 during the 1940s-themed rematch. 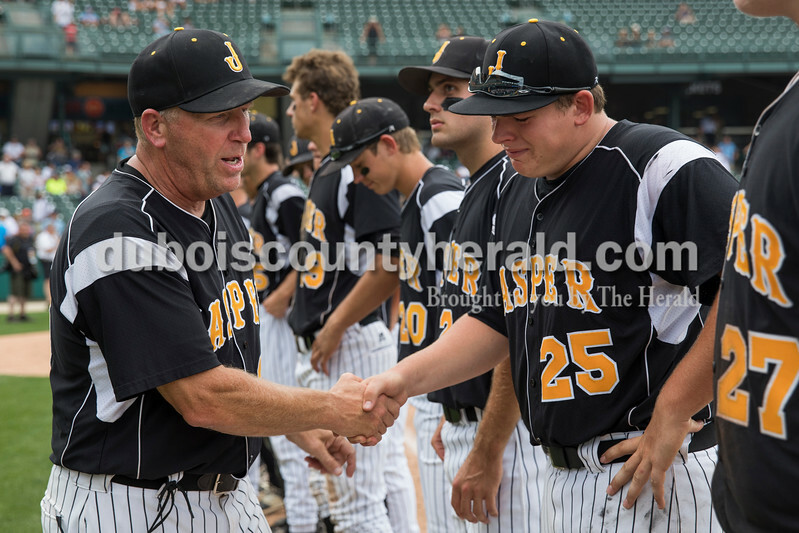 Alan Nass of Huntingburg talked to Jerry Birge of Jasper before the start of the Bombers game during Saturday's 25th anniversary celebration of the film "A League of Their Own" at League Stadium in Huntingburg. Nass's wife, Connie, was the former Mayor of Huntingburg who made it possible for the film to be produced in Huntingburg. 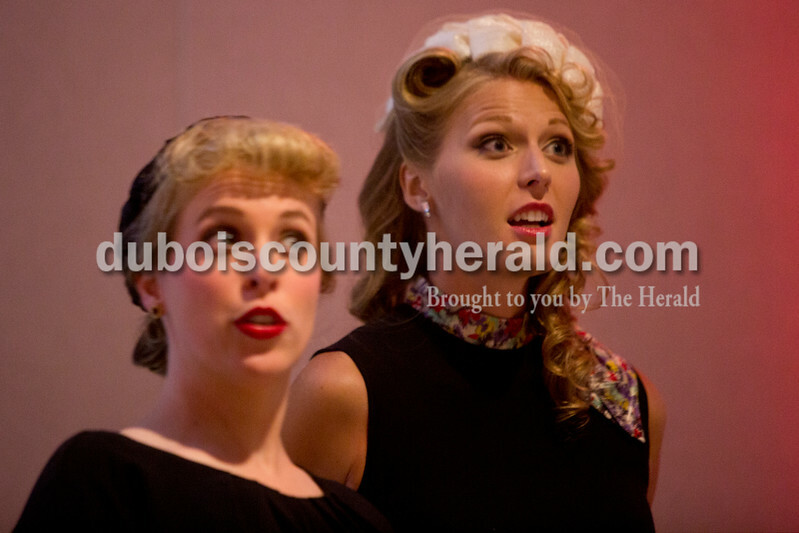 Emily Meyer of Huntingburg, left, and Lauren Sergesketter of Holland socialized while dressed in 1940s inspired clothing during Friday's 25th anniversary celebration of the film "A League of Their Own" at the Huntingburg Event Center in Huntingburg. Attendees dressed up in their 1940s inspired outfits to enjoy the guest speakers and festive food and drinks. 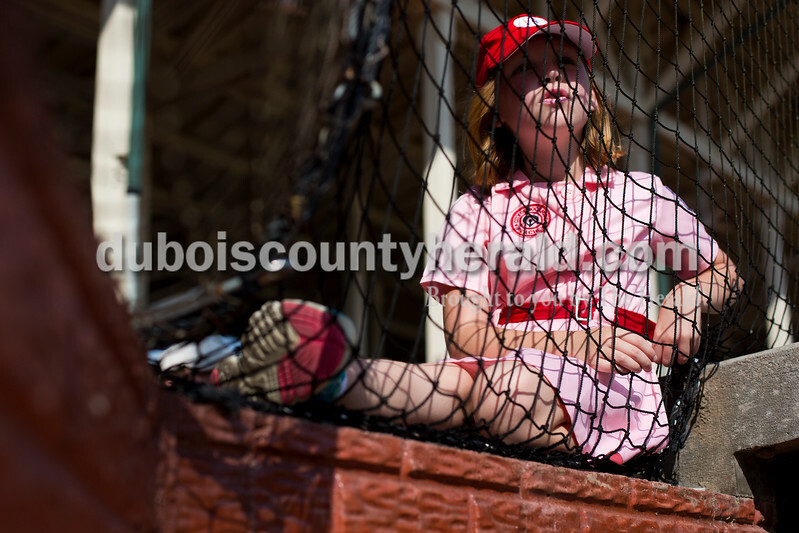 Kalli Chambers of Holland dressed up as a Rockford Peaches while while watching Saturday's game against the Racine Belles at League Stadium in Huntingburg during the 25th anniversary celebration of "A League of Their Own." The Peaches and Belles tied 8-8 during the 1940s-themed rematch. 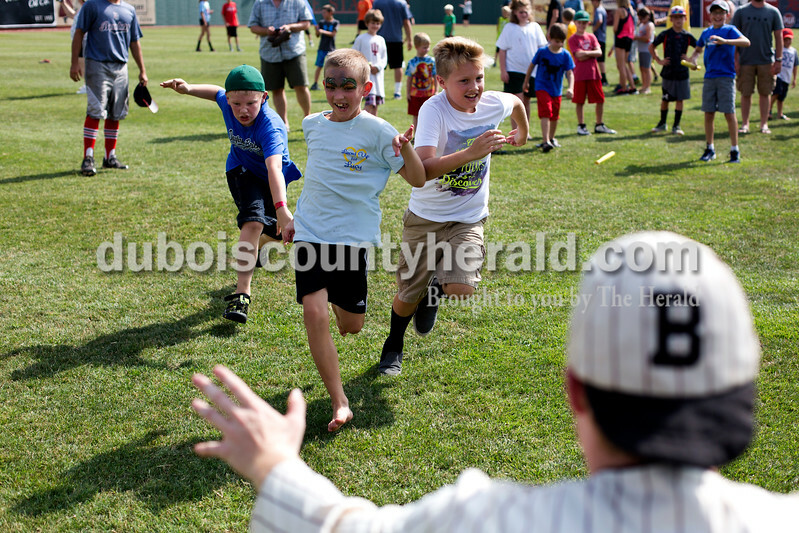 Caiden Beck of Ferdinand, 8, from left, Gavin Jones of Duff, 9, and Dane Butcher of Lynnville, 9, raced to the mascot "Casey" while playing games during Saturday's 25th anniversary celebration of the film "A League of Their Own" at League Stadium in Huntingburg. 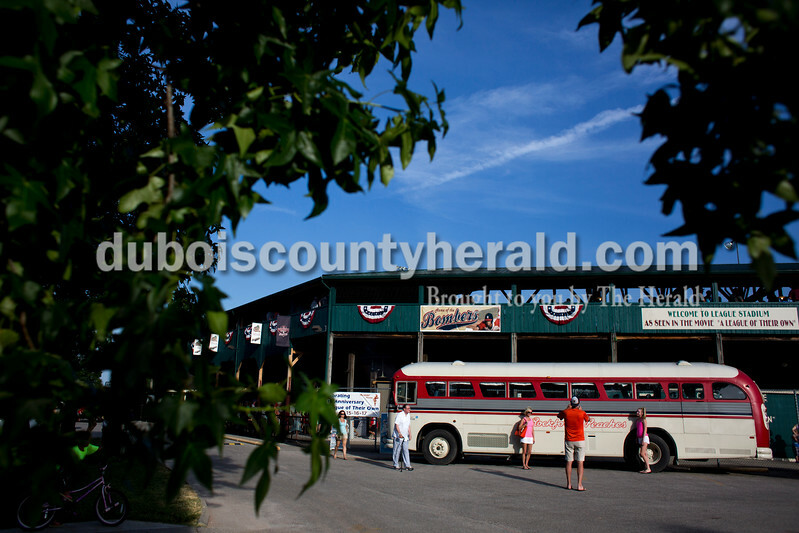 Mike Browning of St. Louis, Mo., took a photo of his wife, Nicole, left, and daughter, Carly, 15, as they posed in front of the Rockford Peaches' bus during Saturday's 25th anniversary celebration of the film "A League of Their Own" at League Stadium in Huntingburg. Patty Sermersheim of Stendal accessorized in clothing from the 1940s, including vintage knee highs that were her Aunt Helen Schuetter of Jasper, during Friday's 25th anniversary celebration of the film "A League of Their Own" at the Huntingburg Event Center in Huntingburg. Sermersheim and her twin sister, Peggy Meyer of Boonville, acted as paid extras in the film and can be scene in the background of several shots. Attendees dressed up in their 1940s inspired outfits to enjoy the guest speakers and festive food and drinks. 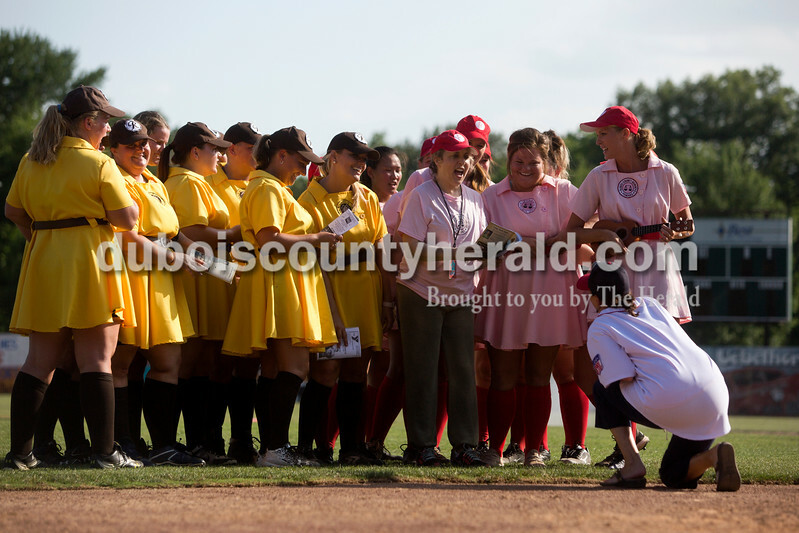 The Rockford Peaches and the Racine Belles chatted in the dugout together before playing at League Stadium on Saturday in Huntingburg during the 25th anniversary celebration of "A League of Their Own." The Peaches and Belles tied 8-8 during the 1940s-themed rematch. 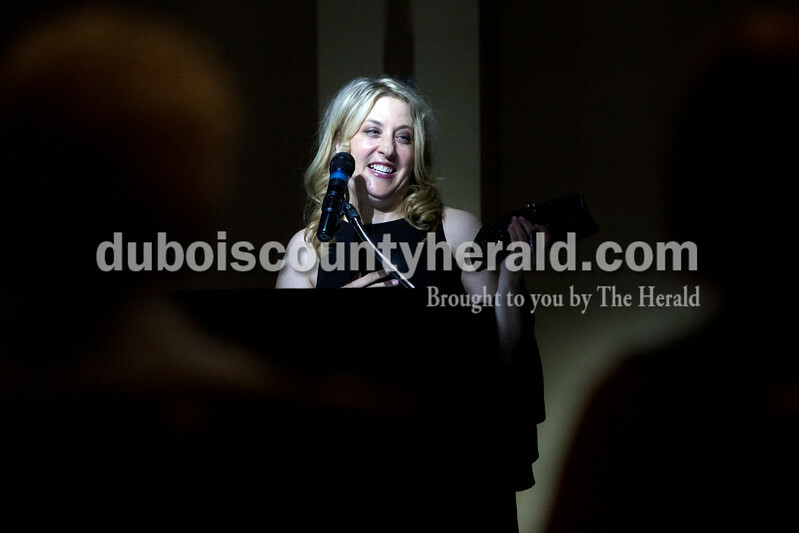 Actress Bitty Schram, who played Evelyn Gardner in the film "A League of Their Own," talked about her experience on set and answered questions from the audience during Friday's 25th anniversary celebration of the film "A League of Their Own" at the Huntingburg Event Center in Huntingburg. Attendees dressed up in their 1940s inspired outfits to enjoy the guest speakers and festive food and drinks. 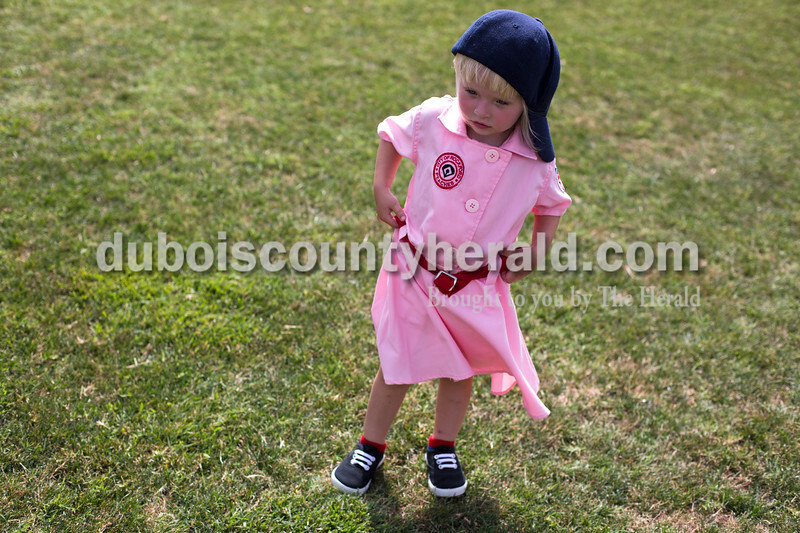 Amrin Vonderheide of St. Anthony, 2, pulled up the belt to her Rockford Peaches outfit while playing games during Saturday's 25th anniversary celebration of the film "A League of Their Own" at League Stadium in Huntingburg. 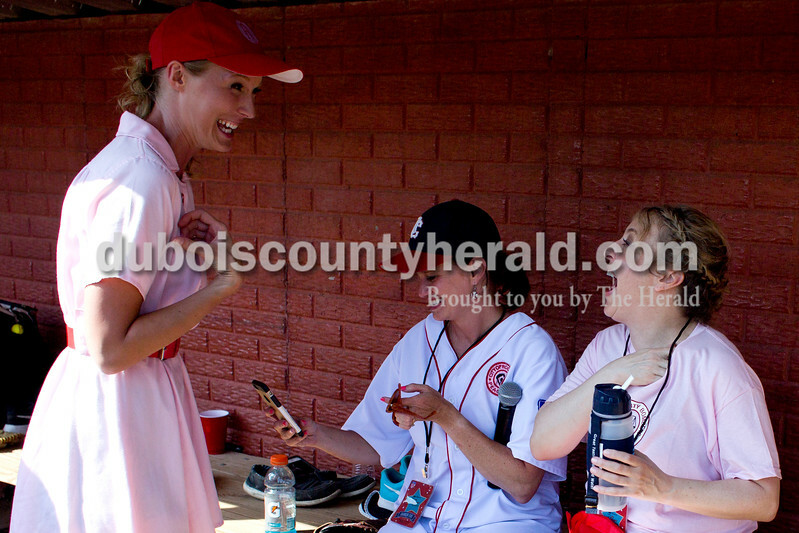 Rockford Peaches' Lauren Sergesketter of Holland talked with Actress Bitty Schram, who played Evelyn Gardner, during the 25th anniversary celebration of "A League of Their Own" at League Stadium in Huntingburg. The Peaches and Belles tied 8-8 during the 1940s-themed rematch. 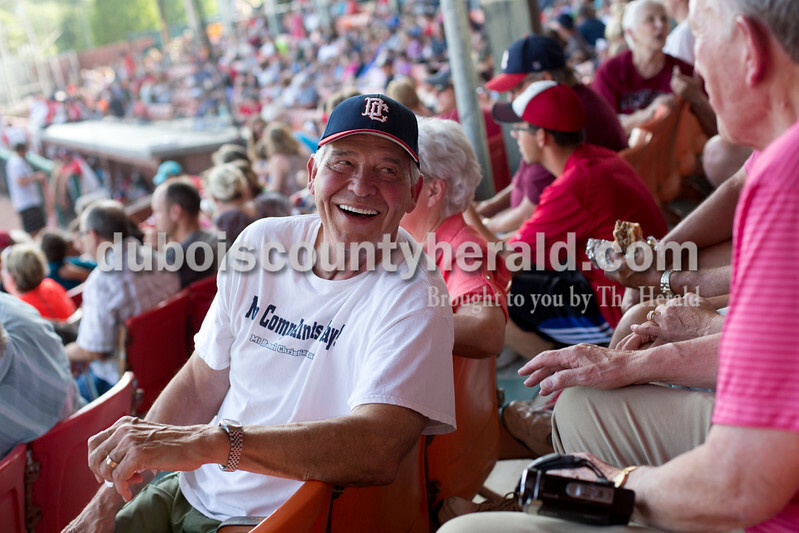 Stan Sollman, left, and Rolly Terwiske, both of Huntingburg, talked while looking at old photos during Friday's 25th anniversary celebration of the film "A League of Their Own" at the Huntingburg Event Center in Huntingburg. Terwiske's wife, Kate, and two sons acted as extras while the movie was being filmed. Attendees dressed up in their 1940s inspired outfits to enjoy the guest speakers and festive food and drinks. 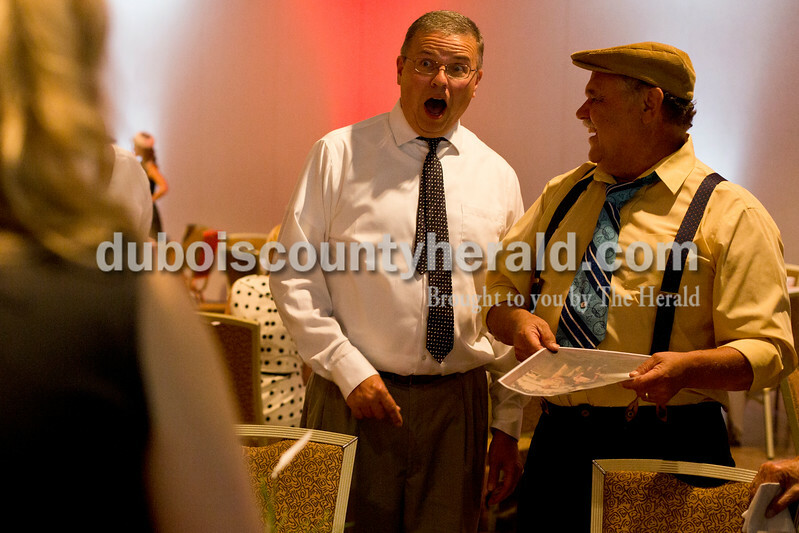 Greg Gogel of Huntingburg and Mary Uebelhor of Huntingburg laughed at Bitty Schram and Justin Scheller's response to questions during Friday's 25th anniversary celebration of the film "A League of Their Own" at the Huntingburg Event Center in Huntingburg. Attendees dressed up in their 1940s inspired outfits to enjoy the guest speakers and festive food and drinks. 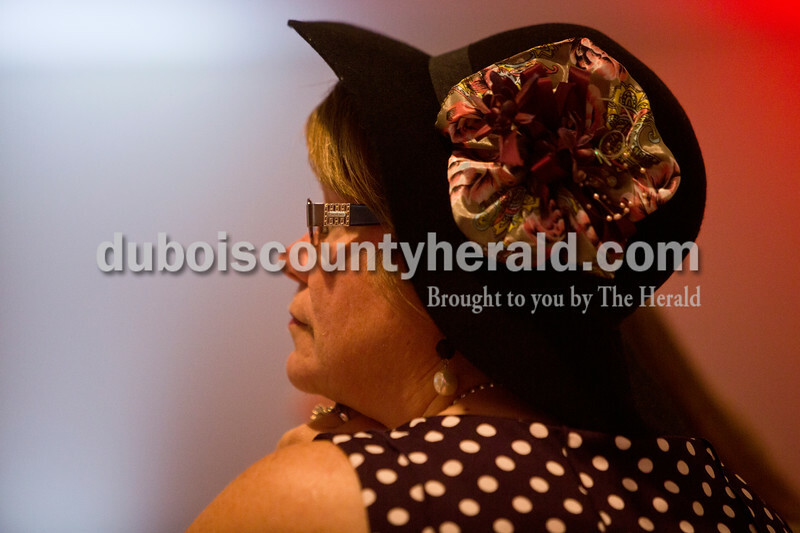 Karen Haug of Ferdinand sat and listened to guest speakers during Friday's 25th anniversary celebration of the film "A League of Their Own" at the Huntingburg Event Center in Huntingburg. 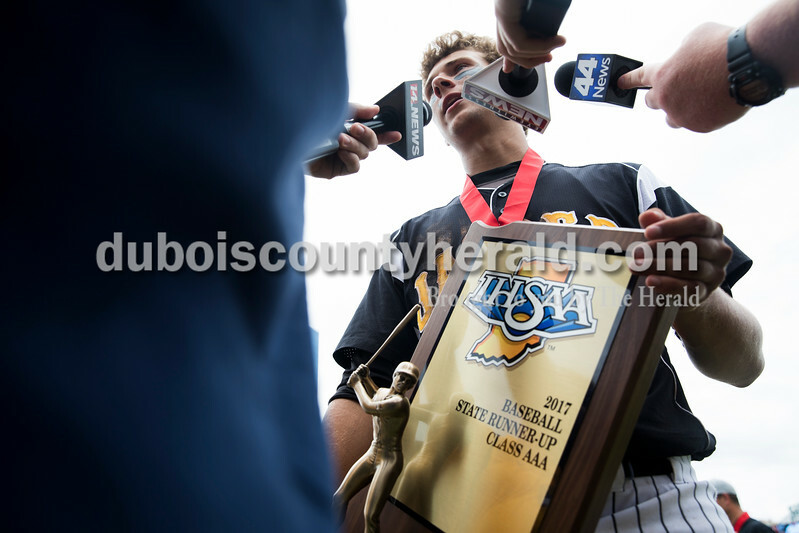 Haug grew up two blocks from League Stadium and remembered when the movie was being filmed. Attendees dressed up in their 1940s inspired outfits to enjoy the guest speakers and festive food and drinks. 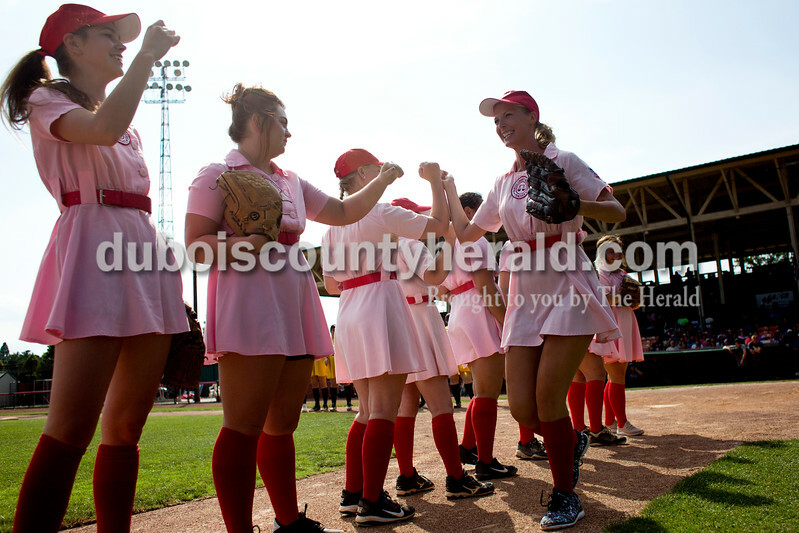 The Rockford Peaches and the Racine Belles sang the official All-American Girls Professional Baseball League victory song with Actress Bitty Schram, who played Evelyn Gardner in "A League of Their Own," during the film's 25th anniversary celebration at League Stadium in Huntingburg on Saturday. The Peaches and Belles tied 8-8 during the 1940s-themed rematch. 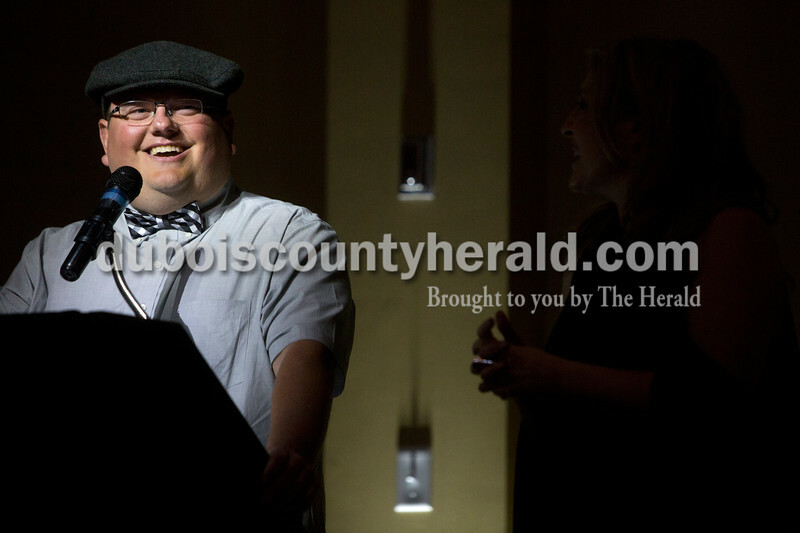 Actor Justin Scheller, who played Stilwell Gardner in the film "A League of Their Own," talked about his experience on set with Actress Bitty Schram, who played Stilwell's mother Evelyn Gardner, during Friday's 25th anniversary celebration of the film at the Huntingburg Event Center in Huntingburg. Attendees dressed up in their 1940s inspired outfits to enjoy the guest speakers and festive food and drinks. Dede Britzman of Jasper walked hand-in-hand with her father, Ed Young of Jasper, a cancer survivor, during the 2017 Dubois County Relay for Life on Saturday at Jasper Middle School in Jasper. The theme for this year's ceremony was "Not all superheroes wear capes." Different events and activities were planned throughout the day for fighters, survivors and families supporting the cause. 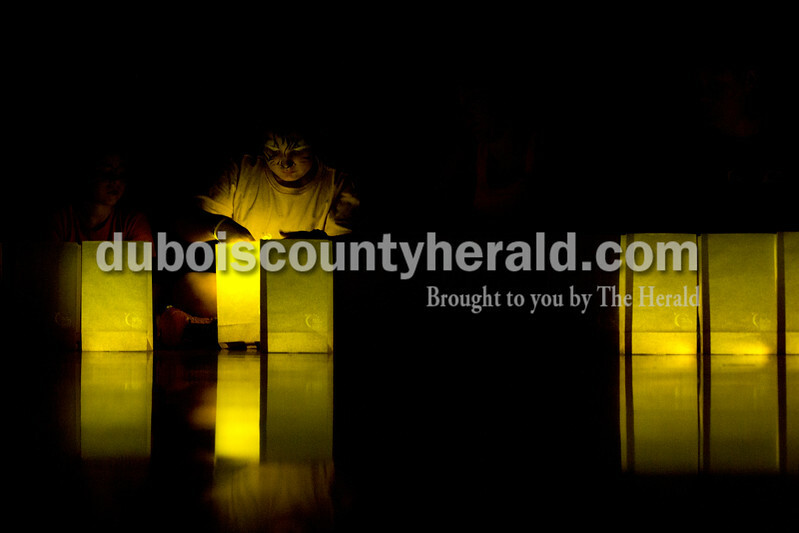 Corvin Hoffman of Mentor, 9, placed a glow stick in one of the commemorative bags during the luminaria ceremony at the 2017 Dubois County Relay for Life on Saturday at Jasper Middle School in Jasper. 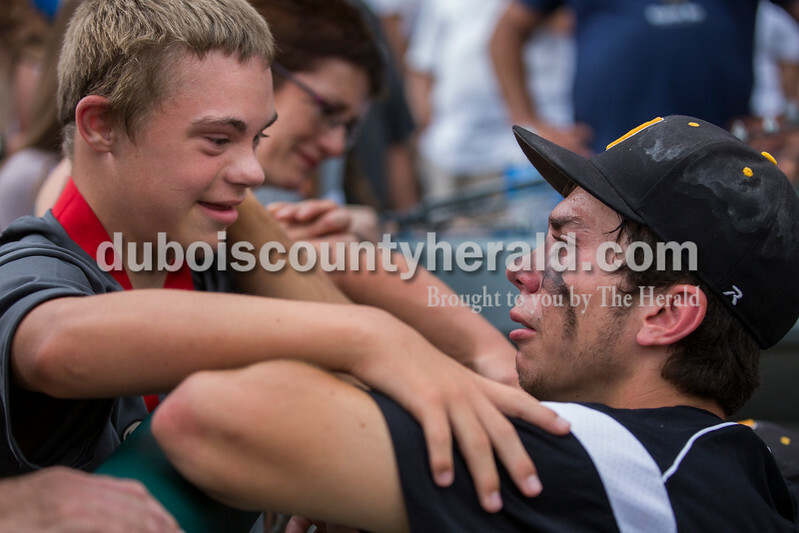 The theme for this year's ceremony was "Not all superheroes wear capes." Different events and activities were planned throughout the day for fighters, survivors and families supporting the cause. 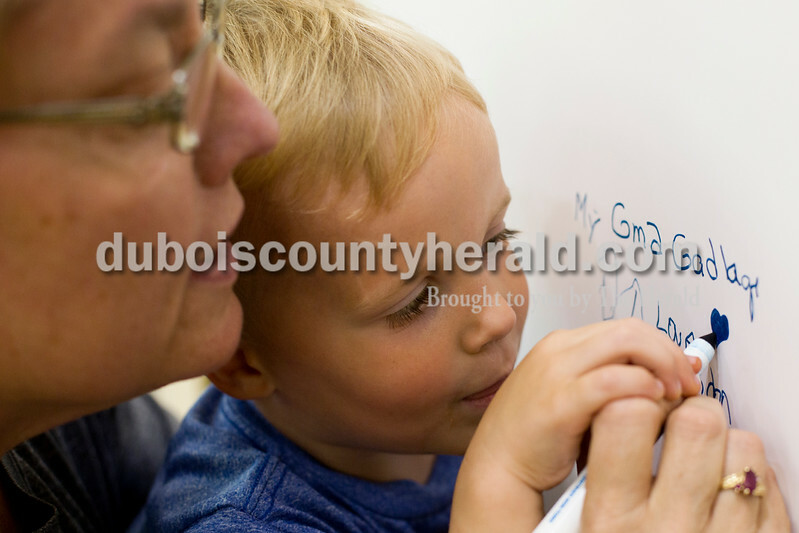 Angie Kieser of Jasper held her grandson Brandon Kieser of Jasper, 3, while helping him write "My Superhero is...my Gma Gadlage" on the Superhero wall during the 2017 Dubois County Relay for Life on Saturday at Jasper Middle School in Jasper. 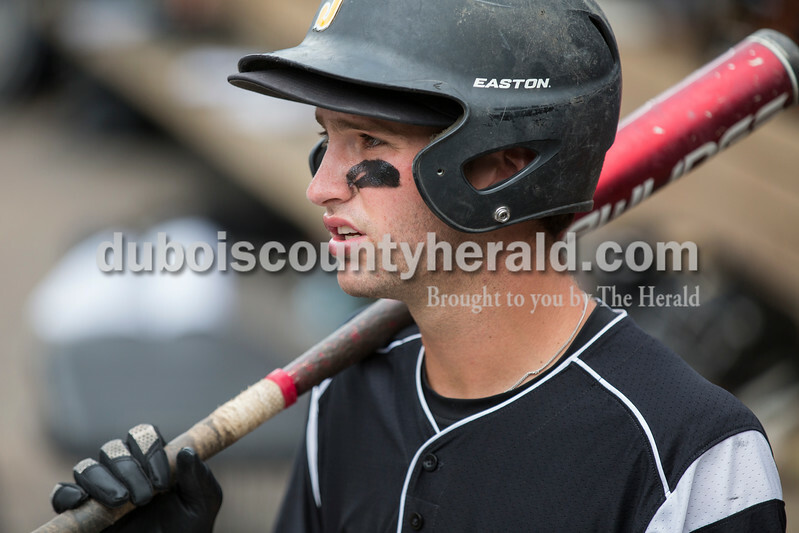 Brandon's great-grandmother, Pat Gadlage, is a cancer survivor. 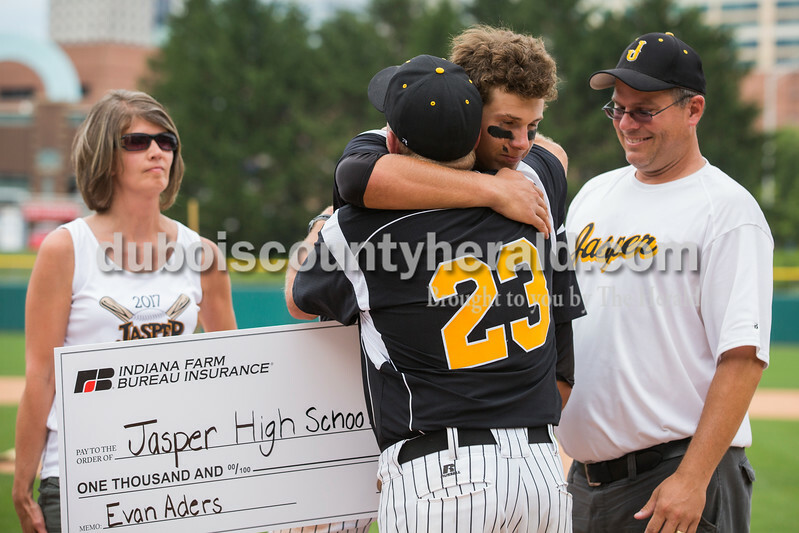 The theme for this year's ceremony was "Not all superheroes wear capes." Different events and activities were planned throughout the day for fighters, survivors and families supporting the cause. Steve Schoppenhorst of Huntingburg, from left, his wife, Valerie, their daughters, Stephanie Grierson of Jasper and Jennie Hoffman of Huntingburg, and their granddaughter, Kryssie Grierson of Jasper, 8, broke out in a dance while walking laps during the 2017 Dubois County Relay for Life on Saturday at Jasper Middle School in Jasper. The theme for this year's ceremony was "Not all superheroes wear capes." Different events and activities were planned throughout the day for fighters, survivors and families supporting the cause. 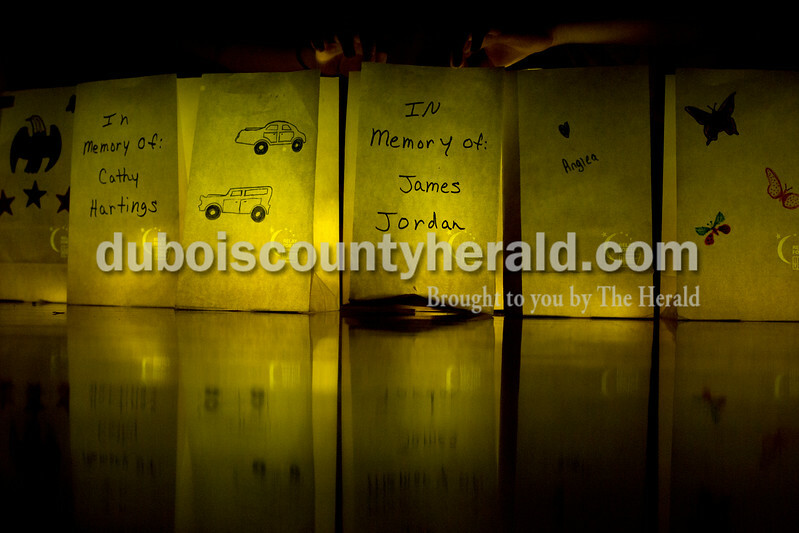 Commemorative bags were decorated and lit with glow sticks during the luminaria ceremony at the 2017 Dubois County Relay for Life on Saturday at Jasper Middle School in Jasper. The theme for this year's ceremony was "Not all superheroes wear capes." Different events and activities were planned throughout the day for fighters, survivors and families supporting the cause. 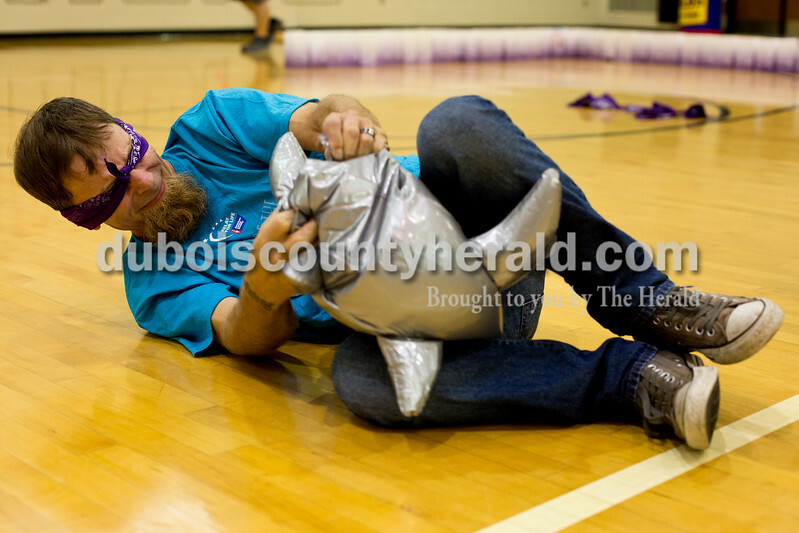 Chris Wilson of Dubois, and the activities lead for the event, wrestled an inflatable shark while participating in one of the scheduled activies during the 2017 Dubois County Relay for Life on Saturday at Jasper Middle School in Jasper. The theme for this year's ceremony was "Not all superheroes wear capes." Different events and activities were planned throughout the day for fighters, survivors and families supporting the cause. 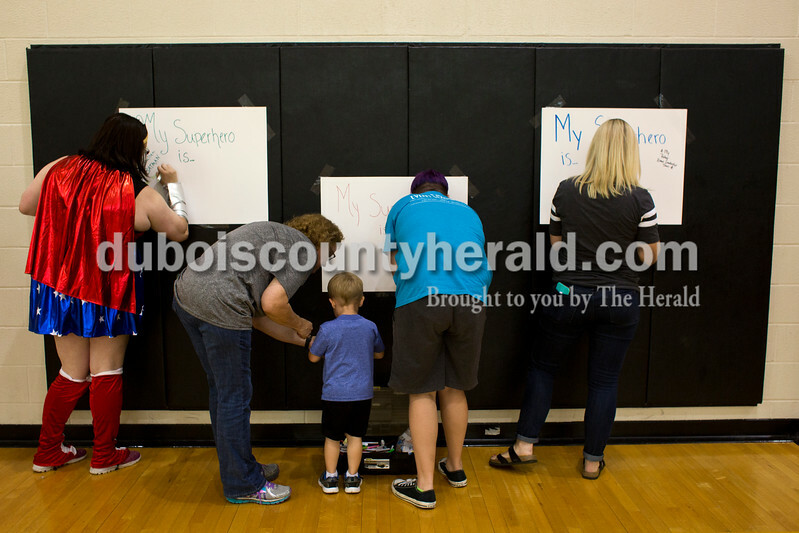 Attendees wrote the name or names of people who inspire them on the "My superhero is..." wall during the 2017 Dubois County Relay for Life on Saturday at Jasper Middle School in Jasper. The theme for this year's ceremony was "Not all superheroes wear capes." Different events and activities were planned throughout the day for fighters, survivors and families supporting the cause. 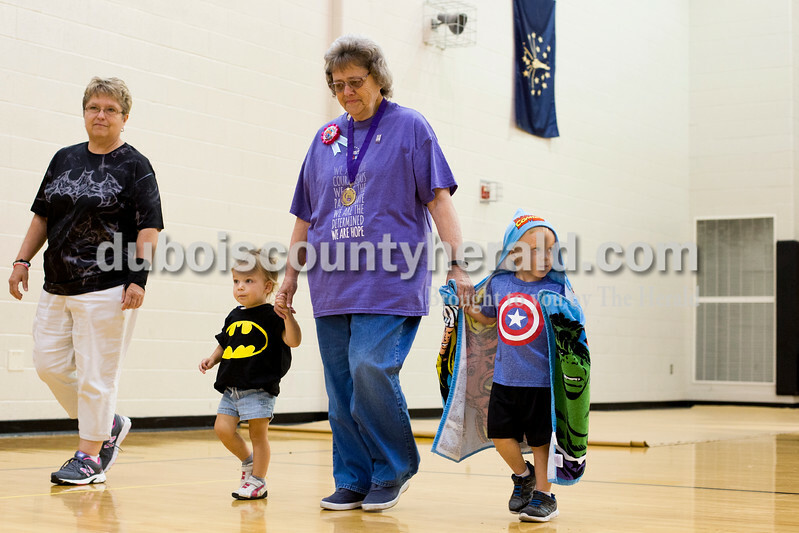 Cancer survivor Pat Gadlage of Jasper walked laps around the gym while holding hands with her great-grandchildren Madison Kieser of Jasper, 2, and her brother, Brandon, 3, during the 2017 Dubois County Relay for Life on Saturday at Jasper Middle School in Jasper. The theme for this year's ceremony was "Not all superheroes wear capes." Different events and activities were planned throughout the day for fighters, survivors and families supporting the cause. 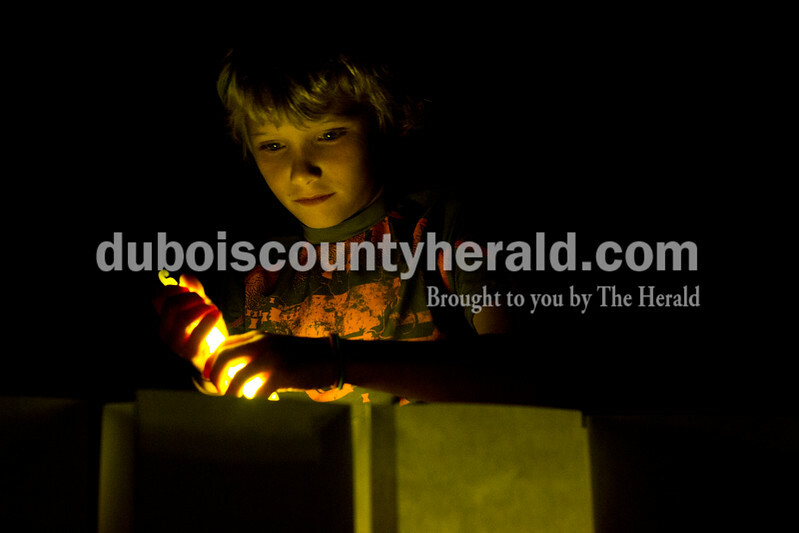 Wylon Schoppenhorst of Velpen, 9, lit a glow stick during the luminaria ceremony at the 2017 Dubois County Relay for Life on Saturday at Jasper Middle School in Jasper. 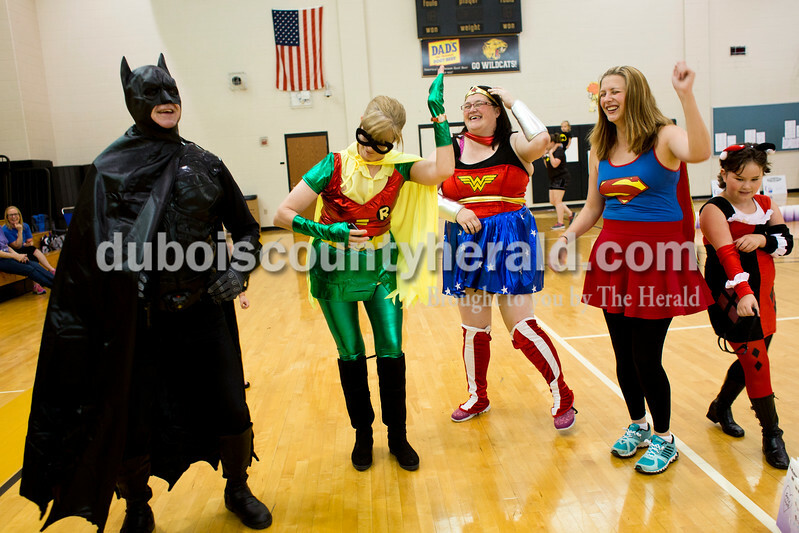 The theme for this year's ceremony was "Not all superheroes wear capes." Different events and activities were planned throughout the day for fighters, survivors and families supporting the cause. 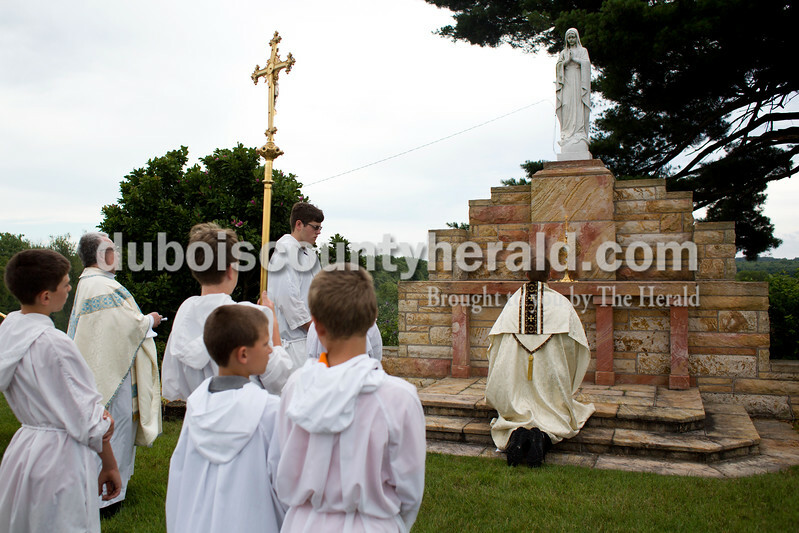 Father Ryan Hilderbrand knelt before an alter in the cemetery behind St. Mary Catholic Church during the Corpus Christi Procession through Huntingburg on Sunday. 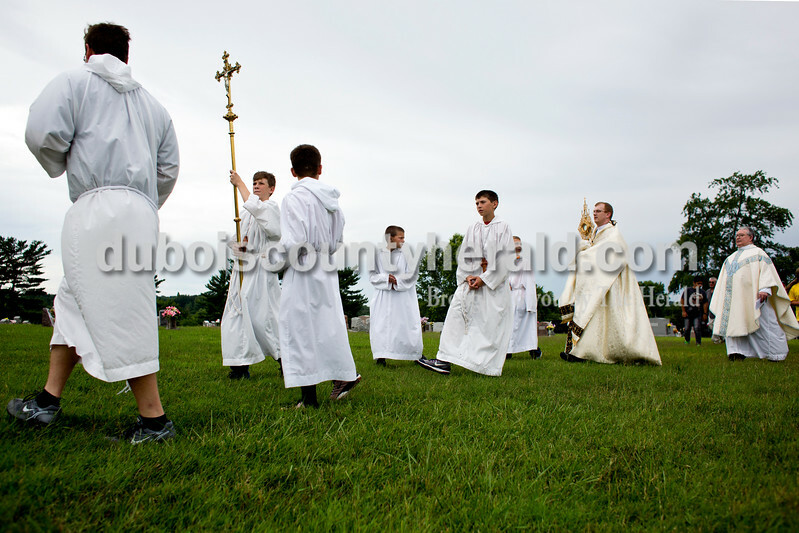 Members of St. Mary Catholic Church in Huntingburg sang and chanted as they followed Father Ryan Hilderbrand through the the parish neighborhood while he carried the sacrament of monstrance. The procession took place directly after the 10 a.m. bilingual mass. 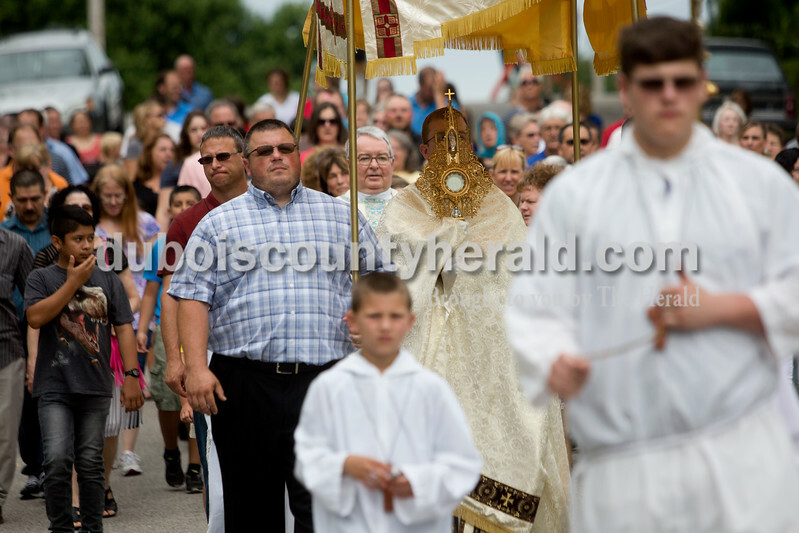 Father Ryan Hilderbrand, second from right, carried the sacrament of monstrance through the cemetery behind St. Mary Catholic Church to the alter during the Corpus Christi Procession through Huntingburg on Sunday. Members of St. Mary Catholic Church in Huntingburg sang and chanted as they followed Father Hilderbrand through the the parish neighborhood. The procession took place directly after the 10 a.m. bilingual mass. 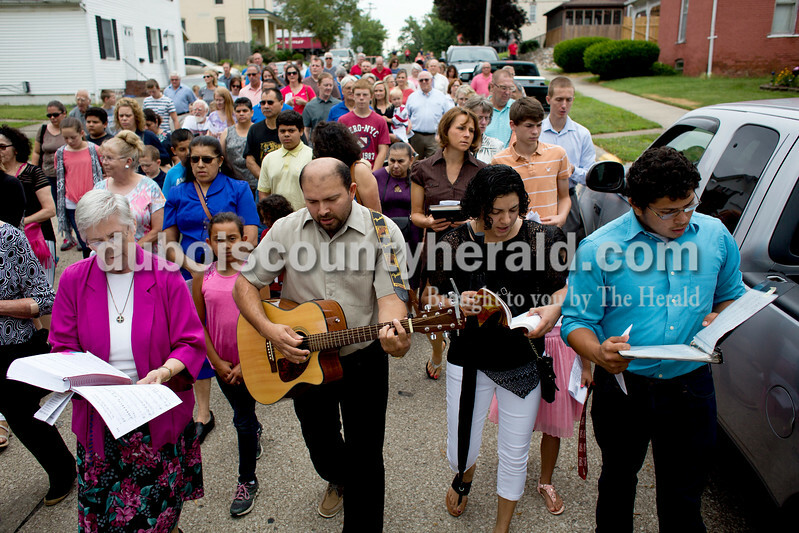 Jose Dubon of Huntingburg, center, played his guitar as he led members of St. Mary Catholic Church in song while following Father Ryan Hilderbrand through the the parish neighborhood as he carried the sacrament of monstrance during the Corpus Christi Procession through Huntingburg on Sunday. The procession took place directly after the 10 a.m. bilingual mass. 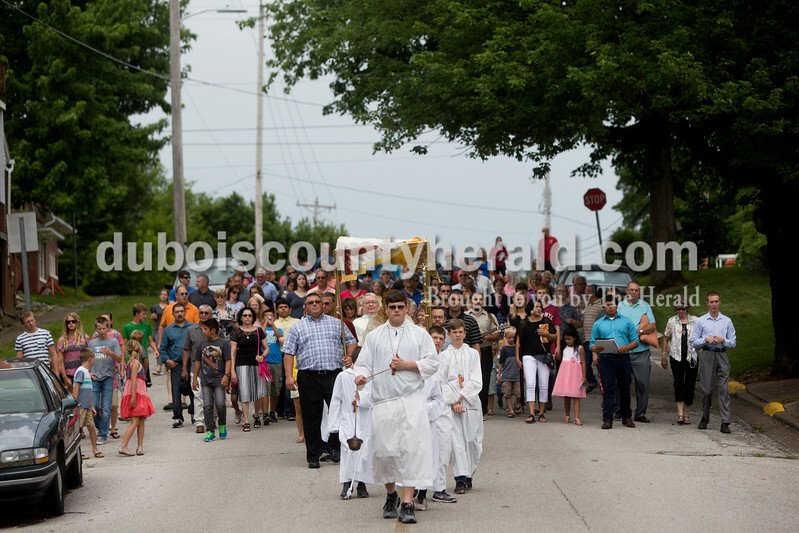 Garrett Altmeyer of Huntingburg, held incense while leading Father Ryan Hilderbrand with the sacrament of monstrance and members of St. Mary Catholic Church through the parish neighborhood during Corpus Christi Procession on Sunday. The procession took place directly after the 10 a.m. bilingual mass. 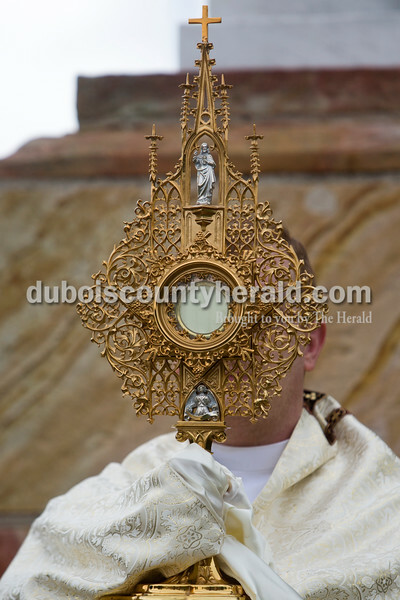 Father Ryan Hilderbrand held the sacrament of monstrance at the alter in the cemetery behind St. Mary Catholic Church after the Corpus Christi Procession through Huntingburg on Sunday. Members of St. Mary Catholic Church in Huntingburg sang and chanted as they followed Father Hilderbrand through the the parish neighborhood. The procession took place directly after the 10 a.m. bilingual mass. 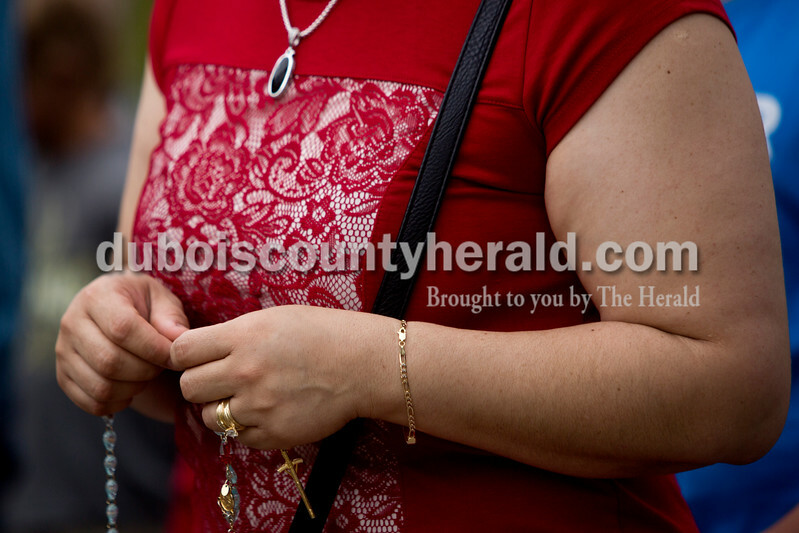 Maria Miranda Dubon of Huntingburg held her rosary as members of St. Mary Catholic Church sang, prayed and chanted during the Corpus Christi Procession through Huntingburg on Sunday. Father Ryan Hilderbrand guided members through the the parish neighborhood as he carried the sacrament of monstrance. The procession took place directly after the 10 a.m. bilingual mass. Father Ryan Hilderbrand carried the sacrament of monstrance during the Corpus Christi Procession through Huntingburg on Sunday. Members of St. Mary Catholic Church in Huntingburg sang and chanted as they followed Father Hilderbrand through the the parish neighborhood. The procession took place directly after the 10 a.m. bilingual mass.